While online sales have experienced high growth rates, e-commerce adoption rates by Canadian SMEs have not kept pace. Canadian SMEs continue to lag behind the US and the EU in adopting e-commerce. Recently, a survey of SMEs’ adoption of e-commerce was conducted to determine reasons for this low adoption rate (Sparling, 2007; Sparling, Cater-Steel, & Toleman, 2007). Constructs used in the survey focussed on three contexts: organizational, external environmental and innovation. The study found significant factors that differentiated adopters and non-adopters of e-commerce included technological opportunism and readiness, owner experience with computers, support within the organization, relative advantage and compatibility. This chapter focuses on the definitions of the variables in the organizational context. This chapter uses Rogers’ (1995) definition of adoption: adoption is the decision to make full use of an innovation as the best course of action available, while rejection is the decision to not adopt. Rogers (1995) and many subsequent researchers, including Kendall et al. (2001) and Saythe and Beal (2001), have shown that perceptions of the attributes of an innovation affect its rate of adoption. Rogers (1995) identified five perceived attributes of innovations that affect their rate of adoption: relative advantage, degree of compatibility of the innovation, complexity, trialability and observability. He found these five characteristics to be the main determinants explaining 49 to 87 percent of the variance in the rate of adoption (Rogers 1995). There is a growing body of research into information systems innovation adoption. Some of the information systems studied have been interorganisational systems (IOS), such as EDI. Henriksen (2002) defines an interorganisational system as an information system that is shared by two or more companies. EDI and e-commerce can be considered interorganisational systems in that information crosses organization boundaries. Both EDI and e-commerce can affect the supply chain, trading partners, technology providers and governing bodies. The relationships can be very complex, creating the need for many variables when examining the adoption of e-commerce. Ling (2001) argues that diffusion of innovation theory is relevant to the study of e-commerce due to the technical components of e-commerce, but that e-commerce has unique features, such as interorganisational elements, which distinguish it from other types of innovations. The technological innovation literature has not produced a consistent set of factors that affect organizational adoption. Adoption: the decision to make full use of an innovation as the best course of action available, while rejection is the decision to not adopt. Commitment: the preparedness of a business, under the direction of its owner, to continuously innovate and reinvent its business strategy. Successful companies easily and quickly incorporated new ideas, technologies and market opportunities into their business strategy. Interorganisational system: an information system that is shared by two or more companies. EDI and e-commerce can be considered interorganisational systems in that information crosses organisationorganization boundaries. 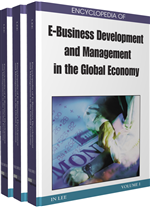 SME small medium enterprises: in this chapter, small- to medium-sized enterprises (SMEs) are defined as businesses with fewer than 200 employees. Different measures have been used to measure the size of organizations, including the number of employees, value of assets, revenue generated, and type of ownership. Technological opportunism: The technology sensing capability is an organisation’sorganization’s ability to acquire knowledge about and understand new technology developments, which may be developed either internally or externally. E-Commerce: the processing of business transactions using computer networks, including the Internet. External environmental context: includes market conditions such as competitive market forces, market uncertainty, and government regulation.